To give some background - I have a summer 2001 600 MHz Graphite iMac G3 (CD-RW) that I bought new in 2001 for $1,299 while in college. If only I had waited about four months until January 2002, when the flat panel G4s were introduced and this unit dropped $300 in price (grumble, grumble). At any rate, this machine has seen better years in light of many technological advances since 2001 - and I've desired for some time to do something fun with the old G3, since it has taken a back seat to my 1.42 GHz eMac G4 and 1.67 GHz hi-res 15" PowerBook G4. This iMac has a bigger place in my heart than my hi-res PowerBook (this iMac, after all, is the only system I've ever purchased new). Some guys want to hang on to their first car and tinker with it until it dies. To this Mac enthusiast and gamer, this is definitely the equivalent! The iMac has a place in the home entertainment center. 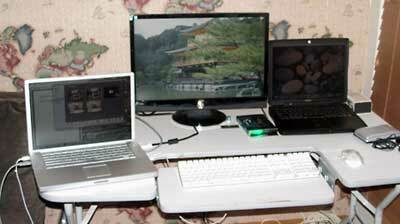 As a man on a tight budget and a firm believer in utilizing low-end Macs, I was to determined make use of the old iMac and control it remotely as a simple entertainment device without investing much. After all, these units are now 8 years old and have very little residual value. An original AirPort Card with the iMac adapter is probably worth more than the iMac itself! At this point, I would like to give my thanks to Low End Mac's Adam Rosen for helping me discover a great old application called Chicken of the VNC. It's a funny name for an app, but the price is right - free (it's open source). Adam wrote a great article, Remotely Control Your OS 9 or OS X Mac, back February 2008, which I found extremely useful. It pointed me in the right direction of the aforementioned application. Chicken of the VNC lets you view a Mac's display from another machine, as well as control it with your mouse and keyboard. It is easy to set up and use. Other discussion boards recommended it too, so I installed the client on both my hi-res PowerBook (running Mac OS X 10.5 "Leopard"), and on the iMac in the entertainment center running Mac OS X 10.4 "Tiger" and gave it a shot. Why not just use a wireless keyboard? The reason for going through all this trouble: In true low-end Mac fashion, I didn't want to bother spending the cash for a wireless Apple compatible keyboard and mouse to control the machine remotely, since I don't really need one just yet (yeah, they're cheap - but so am I). Additionally, it's kind of awkward to have to pull out a wireless keyboard to control your music and such at a gathering. At any rate, after installing the software on both machines, I connected them by routing a 25' ethernet cable, which I happened to have lying around, behind my couch from the iMac in the entertainment center to my workstation located in the corner of the room. I restarted both machines and kept my fingers crossed. via VGA and 15" 1.67 GHz PowerBook connected via DVI. I also ran a stereo Y cable I had from the iMac to my receiver to test the sound output, and it's perfect. Now I can go to my workstation and command the iMac to play music discretely. It really gives you a better sense of control! Find a wireless gaming controller that works in both OS 9 and OS X.
I've looked at some VGA-to-Component Video converter boxes that aren't too bad (about $30). To my readers - feel free to email me with suggestions if you have any experience with these converter boxes (or if you have a better idea), along with wireless OS 9/OS X controller suggestions. Thanks again to Adam Rosen for writing the article that helped me discover the tools I needed to teach that old Mac a new trick or two! 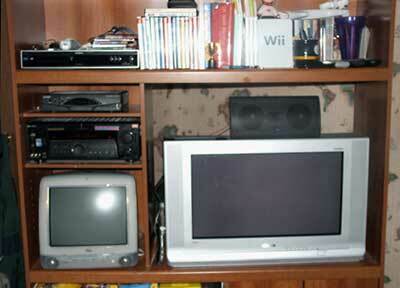 Hopefully I'll be gaming on it again soon with a wireless controller on my CRT HDTV.